I like to think of myself as a creative individual; once I made a full Edward Scissorhand costume without buying a single thing. One Metro Transit rider has put my costume-making skills to shame with his special addition to his bicycle. Metro’s Manager of Project Control and Special Projects Anjana Mohan takes MetroLink daily and noticed one passenger’s unique and creative transportation alternative last week. The man who boarded MetroLink with his bike had cut up his old Missouri license plates and turned them into mud flaps for his bike. The passenger, a chef who works downtown, told Anjana he chose to use his old license plates because he was looking for something reflective and rust proof. The chef said he uses multiple forms of transportation to get to work. 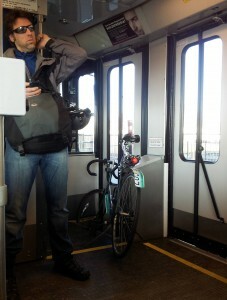 Sometimes he drives, sometimes he bikes, and sometimes he uses Metro. Do you know a Metro passenger with an interesting story? Email me at CLBrooks@MetroStLouis.org. Enjoyed this one, thank you, Chelsea!